The proponents of globalization suggest we buy our food from the cheapest sources, no matter where in the world that might be. Now that food prices are rising again, countries rich and poor have begun to reconsider the price of imported food and many governments, from Brazil to Micronesia, are setting quotas in support of local food production. Nigeria, the world's seventh most populous country, is one of the world's largest food importers. 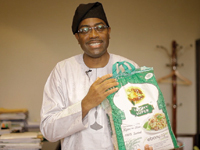 The charismatic Akinwunmi Ayo Adesina, Nigerian Minister for Agriculture, believes it is his job to ensure Nigerians eat food grown in Nigeria. Experts say the Minister's plans could be a model for other African nations. But do people really want to eat only food grown at home? What impact do food policies have on the local economy and local diets? And in a globalized world, is self-sufficiency really the answer? 1. Old or New? - In Lima, Peru, a new generation of top chefs are cooking with traditional ingredients and supporting traditional livelihoods. 2. Food or Fuel? - Kenyan farmer Moses Shaha journeys through the Tana Delta, where farmers are starting to grow jatropha, a biofuel crop. 3. Big or Small? - What's the best method of growing food for a hungry population of 9.5 billion people: Big, or small? 4. Fat or Skinny? - The people of India are faced with a choice: indulge in a Western-style fast food diet, or embrace healthy and indigenous alternatives. 6. Stay or Go? - Who will grow China's food as young people leave the countryside for the cities? "Near or Far? provides much needed good news from Africa. Sub-Saharan Africa in general and Nigeria in particular have the resources to feed itself with food left over for export. Inappropriate government policy has been the major reason why the sub-region is still a net food importer. The Nigerian minister of agriculture has a viable vision to expand food production to feed the current and future generations of Nigerians and he has the experience, knowledge and leadership qualifications to make it happen. Watch Near or Far? and see the model for accelerated African food production." "Very impressive. These films present current problems in global food production and consumption with unstinting clarity. They highlight figures who advocate for indigenous crops without simply turning back the clock or giving in to the Western model of industrial scale agriculture. They propose models which value the local economy and yet think progressively in ways that will help people deal with rising population and increasingly volatile market for foodstuffs. These are thinkers, activists, politicians and farmers who will shape the future of food around the world." "These films put food in a global perspective, pushing the boundaries of discussions about local, artisanal, and organic foods." "The African nation of Nigeria was self-sufficient in food production until the discovery of oil. The oil economy led to massive increases in imports and a weakening of the agricultural sector. In the face of increasing costs and potential shortages, planners are seeking to make Nigeria self-sufficient once again. The insightful Near or Far? examines how different sectors, farmers, manufacturers, merchants, and politicians are working together to feed their country." Include SDH captions for the deaf and hard-of-hearing, and scene selection. "All programs are thought-provoking and educational, with a strong emphasis on sustainability, and excellent choices for high school, college, and public library DVD collections." "Highly Recommended. This 6-part series is a great collection of educational documentaries packed with interviews, insights, and images. Instructors can't go wrong when using these films in classes! Each documentary is independent of the others, but all share the same theme - exploring local solutions for feeding the world. Seeking both the local and international perspectives, the producers interviewed an impressive variety of recognized leaders and professionals working in the sustainable agriculture and human rights arenas including small-scale farmers, lobbyists, United Nations directors, ethicists, local government officials, authors, activists, and even a Nobel Peace Prize winner. The films are less than 30-minutes long each, which makes them perfect for in-class viewing and discussion. Each film is appropriate for a variety of courses ranging from business to anthropology. Whether purchased as a set or individually the price is a deal." "These films contribute to the ongoing debate on whether future food security lies in small-scale farming and biodiversity or industrial agriculture and innovation."